This superb dagger presents us with an intriguing mixture of styles. The polished grip is made of a type of jasper called sange meryam—a stone heavily associated with Jaisalmer in Rajasthan. It has been shaped into the form of a facetted ‘pistol grip’, a style rare enough that the esteemed Robert Elgood notes in his book Rajput Arms & Armour Volume II that he has encountered only one such example. 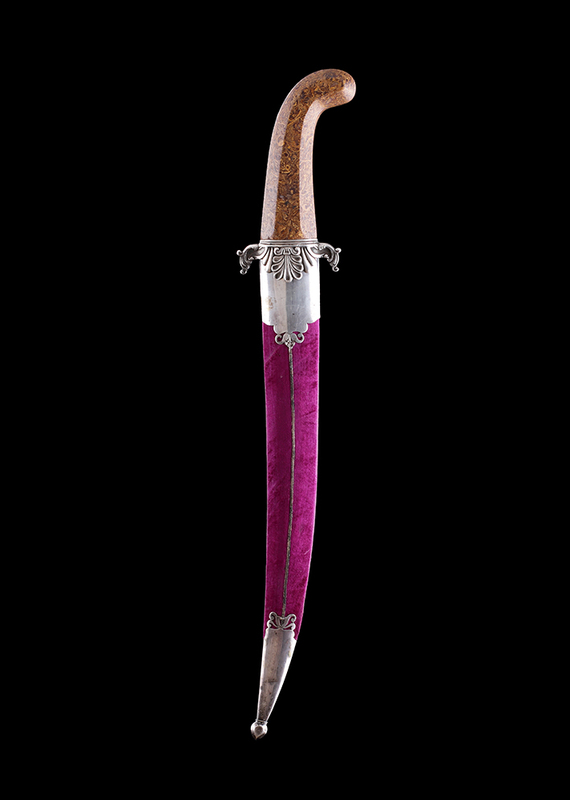 The unusual and attractive guard is made of silver and its langets and quillons have been skilfully shaped to portray palmettes and acanthus leaves that cascade beautifully over the blade. This highly ornate style is redolent of Baroque art and mirrored by the decorative elements that can be seen in the scabbard’s silver mounts. The double-edged blade has a visible scarf weld near to the hilt and gently arcs and tapers until it concludes in a sharp point. The scarf weld gives the blade a flexible heel while still employing a brittle but hard and sharp wootz blade. The Rajputs called this a mala, meaning garland, and its inclusion would be considered auspicious. The central ridge that runs the blade’s entire length is interrupted only by a highly desirable feature known to collectors as Tears of the Wounded. Here, long slots can be seen in the steel, within which roll small, captive spheres. The purpose of this feature still inspires much debate amongst experts, but in this case its inclusion surely has only aesthetic motives—without doubt it shows off the exceptional skills of this dagger’s maker (and the wealth of its purchaser). R. Elgood, Rajput Arms & Armour Volume II, Niyogi Books, 2017, pp.734–735. R. Elgood, Rajput Arms & Armour Volume I, Niyogi Books, 2017, p.190.